High output true single-coil. Recommended for blues, classic rock, garage, heavy rock, classic metal and nu-metal. Developed for the bassist who needs the slammin' output of the Hot but with even stronger attack. The quarter-inch pole pieces and intense windings deliver a full response with great sustain. Includes logo cover. 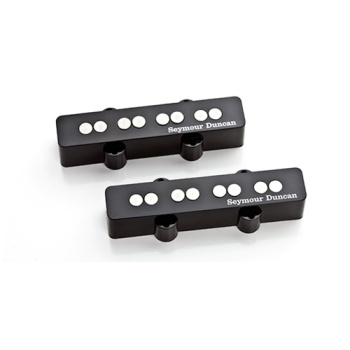 Available in an individual neck and bridge as well as a combined 4-string calibrated neck and bridge set. Neck pickup is slightly narrower. Neck is RW/RP for hum canceling when both pickups are used together. Often used together with STC-2 or -3 Tone Circuits for optimal tonal control. This is the bridge pickup only.